Thursday began my first day of SXSW, even though the festival doesn’t officially open until Friday morning (which is when this article goes up). I began Thursday by going to the Austin Convention Center to pick up my badge (It got very surreal reading on that badge that I was press, and that I was apart of Movie Talk). After that I went to South Austin to cover the press conference for the Texas Film Awards, the annual ceremony put on by the Austin Film Society (a great friend and supporter of this website) that honors actors and directors each year that are from Texas. I’ve been to the ceremony a few times and it’s always a blast, so I was excited to learn that I would be covering the conference and red carpet. After I struggled to find a parking spot in South Austin for the 16th annual Texas Film Awards noon press conference, I was able to find a good seat so I could get a good view of the talent being honored later that evening. The event took place at the Gibson Showroom, a really homely and neat venue that gives the press event that-Texas feel that the out-of-town press enjoys seeing when they come for SXSW. I got there about an hour early, which I later realized I didn’t need to get there THAT early since it wasn’t a massive press conference, just local media and news outlets. I passed by a reporter for the local ABC affiliate KVUE down the hall, and I recognized others in the Austin media scene. Rebecca Campbell, the Executive Director of the Film Society, begun the press conference with a few notes and announcements for the conference and the Awards gala later that evening. After her introduction, she brought up 2016 honorees Carol Burnett, Chandra Wilson, Michael Barker and Jesse Plemons. 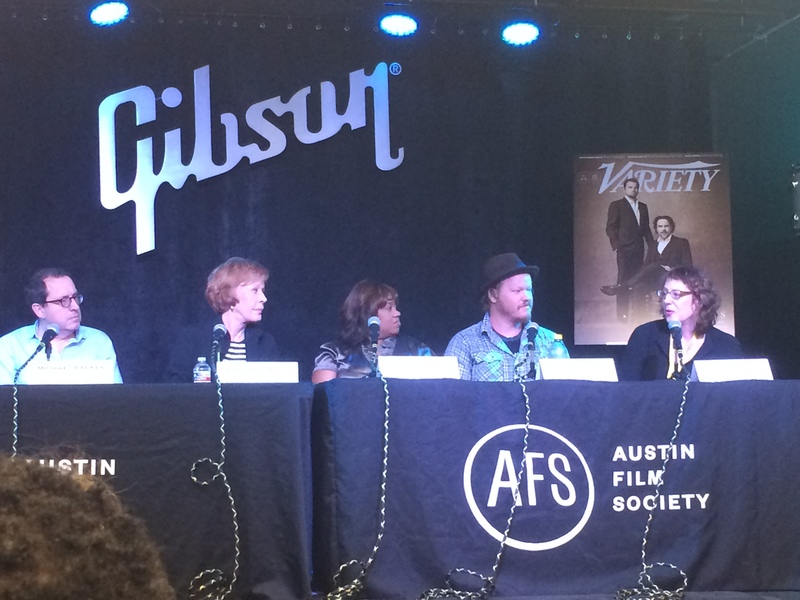 Janet Pierson, the head of SXSW film also joined the panel that was moderated by Steven Gaydos of Variety (Richard Linklater was mentioned on the press release, but he was a no-show). The Press Conference, which was a breezy 45 minute talk about film, comedy, acting, and everything inbetween, began with Michael Barker talking about what “fire in the belly” meant for him. Mr. Barker noted that “talent is your desire. I never felt I had much talent, but this idea of talent being your desire worked for me”. Mr. Barker also talked about how he discovered the auteur aspect of filmmaking at a young age, and was really inspired by that and wanted to make films like that. Carol Burnett stole the show many times during the press conference, as all eyes were on the legendary comedian as she told stories of going to movies and how that inspired her and her optimism, even when she was a struggling female actress in New York City getting turned down roles left and right. She also told a terrific story about how she was able to negotiate The Carol Burnett Show with CBS and how there was a huge array of sexism in that environment, since many of the higher-ups wanted her to play her role of Agnes that she had on the Garry Moore Show when she struck it big. They discriminated against her because they didn’t believe she could be like Moore or Sid Caesar and be able to do everything that those men could with their shows. It was also incredibly fascinating to hear her talk about the process of doing The Carol Burnett Show for over 200 episodes over the course of 11 years, and how the beast of the show would work. Chandra Wilson was also one of the funnier parts of the conference, and it was fascinating to learn about how Grey’s Anatomy came to be, and how it started as a midseason replacement and then grew massively in the ratings thanks to an episode debut right after the Super Bowl, and just became the runaway success that it’s been for the past 10+ years. She was also incredibly relatable and funny when discussing how she got where she is now, and that she was able to get by in the beginning of her career by doing little commercials here and there. She also talked about how the generation of Grey’s Anatomy fans varies year after year, and that they come up to her and react to jaw-dropping moments in the show that happened several years ago, which was a funny and touching moment for her. Janet Pierson had some really interesting things to say about how the SXSW Film Festival works, and that the amount of films that have been entered this year “more than doubled” since her first year running the festival 8 years ago. She also talked about how SXSW is one of the most respected and go-to places for comedy. Key examples being how Seth Rogen and Evan Goldberg made sure that they had a cut of their upcoming film, “Sausage Party”, because they admire the festival that much and Rogen told Pierson that, “you are the only place that takes comedy seriously”. I mention Jesse Plemons last because he was the most quiet of the inductees at the conference today. He seemed a little quiet and a bit shy, which there’s nothing wrong with that (you have no idea how anxious I was during the press conference/red carpet today, so I get it). He talked a little bit about how his first lead acting performance in a movie, the upcoming “Other People”, was interesting since he was on set everyday and had to carry this very emotional and powerful film (it’s scheduled to be released later this year), as well as working with Kirsten Dunst on the most recent season of Fargo, and what that was like. The panel then wrapped up, the honorees had their photo-op, then I went home and prepped/got ready for the red carpet. I don’t think I was more nervous for anything recently in my life than going to this red carpet. Sure, I would just be asking softball questions toward the actors and talent involved, but it was still foreboding. This was the first time I had ever done anything like this, and it was incredibly intimidating. It was loud and packed when I got there, a full hour before the first arrivals were to begin. What I didn’t realize is that the procedure ended up calming my nerves entirely. After I checked in, I walked toward the red carpet and noticed that there were names of media outlets on the carpet. As I kept walking, I saw it. 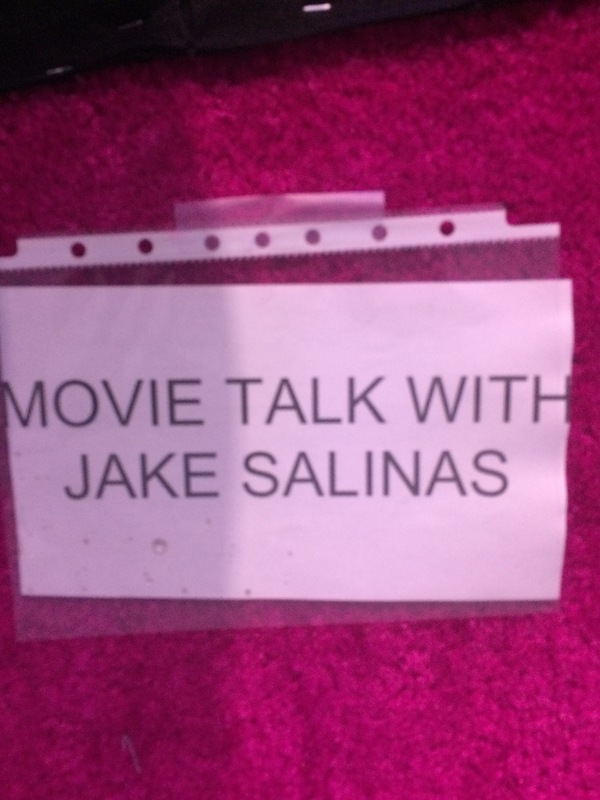 Movie Talk With Jake Salinas. I had my own spot on the red carpet. That was a crazy idea to breath in. I waited for a while and did some last-minute prepping, anxiously awaiting whoever was going to show up first. I kept seeing Rebecca Campbell all over the place and tried to briefly say hi, but she was respectfully very busy during this time. After an hour the first arrivals came, which were primarily donors and auctioneers for the evening (The Texas Film Awards is also an auction to support independent filmmakers in Austin and around Texas). The first person I interviewed was Michael Barker, and I asked him about Miles Ahead, the upcoming biopic on Miles Davis starring Don Cheadle that’s playing next week and is being distributed by Sony Pictures Classics. He appeared to be very enthusiastic about the film, and guaranteed me that it would be an experience not to forget. It was a great little interview, and not just because I’m even more excited for the film. The next person I interviewed was Richard Linklater, my favorite director and the Artistic Director/Founder of the Austin Film Society. I asked what we should expect from his new film, Everybody Wants Some, which is debuting at the festival later tonight. He talked about how the film is incredibly personal to him, and that he was looking forward to the premiere that night. The next person I saw was Brooklyn Decker, the model/actress who lives in Austin with her husband, retired tennis player Andy Roddick. I didn’t know ahead of time that she would be there until I got there, and her publicist came up to me and told me that I’d be interviewing her next. I wasn’t really sure what to ask her due to the spontaneity of it all, so I asked what brought her here to the event that night. I basically asked a pretty rude question in the nicest way possible, which was kind of douchy of me, but luckily she was very lovely and nice to speak with, so it looked like there were no hard feelings. She told me about how she lived here and appeared in one local film in town (Results, which was directed by Andrew Bujalski and debuted at last year’s SXSW), and that she was a fan of Linklater’s as well as fellow local filmmaker Terrance Malick. Short and sweet. I then went through a barrage of interviews with the cast of Everybody Wants Some. All of the guys I interviewed were fairly new to acting and red carpets, so they were incredibly relatable and super cool to me last night. They were all unbelievably excited for the world premiere tonight, and the fact that they were all in a Richard Linklater movie. I look forward to seeing their performances tonight and I wish all of them the very best in their careers going ahead (and not just because they were all super cool dudes). Somehow, Carol Burnett came to my corner of the red carpet. I asked only one question, but it was more than enough for me since I had just met and talked with one of the greatest comedic minds to ever walk the earth. There was no ego with her, even though I asked her a very basic question that other reporters had probably asked her in the evening. She was very lovely, and I was incredibly grateful for the opportunity to talk with her. I didn’t get time to talk with Jesse Plemons or anyone else, but I was fine with that (Jesse did talk with Tracey Schultz, the reporter to my left, right before he went in). It was a really fun and exciting day, and definitely one helluva way to kick off the South by Southwest Film Festival. Remember, follow me on Twitter (@MirJakeSalinas) for any updates relating toward the festival and come back to this website daily for updates on what I’m doing all day.